Somehow in my recent Internet wanderings I stumbled on a blog (the link now lost to me) that was devoted to old-school young adult and middle grade books, the kinds of books I found in the small young adult section at the B. Dalton and Waldenbooks at the mall in the early 1980s and the ones featured in the Scholastic book catalog—the books I read when I wasn’t quite a teenager but wildly curious about what being a teenager would be like. Books by Ellen Conford, Lois Duncan, Beverly Cleary, Judy Blume, and Willo Davis Roberts in her Sunfire-writing days. From what I remember, these weren’t books that adults typically read, unless they were librarians, teachers, or curious parents. And although I continued to reread this books throughout high school, I too stopped reading these books when I became an adult. I might pick up a highly recommended new YA book by the likes of Maggie Stiefvater or Diane Wynne Jones or an esteemed classic by Susan Cooper but those particular books that got me through my preteen years have remained in my past. 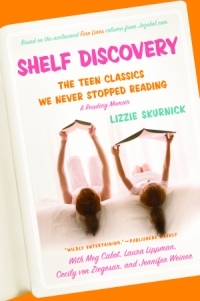 Yet even though I can’t quite cop to the “we never stopped reading” part of the title of this book by Lizzie Skurnick, those books I read over and over at age 11 or so are imprinted in my brain. And seeing those covers again on that blog I’ve already lost track off brought back all those intense preteen feelings. I decided it might be fun to indulge that nostalgia by reading this collection of essays, many of them originally featured in the Fine Lines column at Jezebel. It might have begun with the covers. Most were either snapshots or looked like soft paintings of snapshots (whither, whither the painted cover? ), with girls who were neither good-looking nor not-good-looking, girls in glasses, with braces, standing in front of the mirror or smiling happily in the arms of a boy, glowering in front of a locker, standing with bonnet and hoop skirt on a lonely plane, girls with head, feet, and body miraculously intact. There they were, waiting for the tug on the string that would start them moving and speaking. In them, I found a window, a scrying glass, into a complex consciousness, a life like my own, but writ large in all of its messy ambiguity. Nothing, as of yet, had happened to me. But there was the world, and everything happening in it, right in the bright row of spines. It was waiting for me to pull out the next chapter, to turn the book over, to open the first page and read. Skurnick—and a few notable authors like Jennifer Weiner, Meg Cabot, and Tayari Jones—revisit books that meant something to them when they were young. The essays largely look at the books from both the adult and young adult perspective, as Skurnick considers why the book appealed to her back then and what she sees in it now. She gushes about the kinds of things that seemed gushy-worthy to her younger self—roasting a pig’s tail in Little House in the Big Woods—and comments on the mature themes she missed as a child (and the mature content she pored over in wonder). There are exclamation marks and ALL CAPS!!! when the situation warrants, but the book is more than a squee-fest. Skurnick is thoughtful in her approach to these books. So many of my favorites came up, and I enjoyed the essays on all of them, if only for the pleasing shiver of recognition when Skurnick mentions incidents like Davey’s searching for a rock when she first encounters Wolf in the canyon in Judy Blume’s Tiger Eyes. (Tiger Eyes was my favorite Judy Blume book.) Blume makes frequent appearances here, and reading Skurnick’s essays helped me remember why I loved her books so much. I needed It’s Not the End of the World, for example, when my parents got divorced. Her books consistently let kids know they’re not alone in their worries and fears, and they take those worries seriously without offering pat answers or pretending that everything will be fine while also sending a clear message that even if life isn’t what you want, you’ll find a way through. It hadn’t even occurred to me until reading this how few of Blume’s book have a proper happy ending—they tend to end with the main characters moving on to a new phase, having found some new strength. Other beloved books I revisited through Skurnick were Caroline by Willo Davis Roberts, Fifteen by Beverly Cleary, Go Ask Alice by Anonymous (one of the few books Skurnick acknowledges is terrible in hindsight), Homecoming by Cynthia Voigt, Stranger with My Face by Lois Duncan, and Little House in the Big Woods by Laura Ingalls Wilder. These are the books that are seared into my brain. There were lots of others that I remember reading and enjoying: Bridge of Terabithia by Katherine Paterson, Island of the Blue Dolphins by Scott O’Dell, From the Mixed Up Files of Mrs. 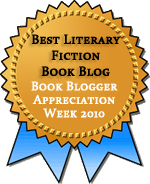 Basil E. Frankweiler by E. L. Konigsburg, The Witch of Blackbird Pond by Elizabeth George Speare, Jacob Have I Loved by Katherine Paterson, and Summer of Fear by Lois Duncan. I enjoyed many of the pieces about books I hadn’t read, many of them well-known classics I should have read (there’s Harriet the Spy by Louise Fitzhugh and The Secret Garden and The Little Princess by Frances Hodgson Burnett). But a few of the essays were well-nigh incomprehensible. For some reason, the books by Madeleine L’Engle seemed completely nuts. (There are pieces on A Wrinkle in Time, which I’ve read, and The Arm of the Starfish, The Moon by Night, and A Ring of Endless Night, which I have not.) There was something about talking to dolphins in one and a whole bunch of overlapping relationships—I couldn’t make heads or tails of it, but it sounded weirdly good. Anyway, I’ve gone on long enough, but I couldn’t resist letting this go without leaving you a collage of some of the covers that I remember so vividly from my preteen and early teen reading. What are some of the books you can’t forget? Do any of these ring a bell? Incidentally, Lizzie Skurnick has her own imprint now, dedicated to putting classic young adult books back in print. I don’t see any of my particular favorite books there, but I do see some beloved authors. Part of me would really enjoy revisiting some of them to see if they hold up to my adult sensibilities, and another part would rather bask in my memories. This entry was posted in Children's / YA Lit, Nonfiction. Bookmark the permalink. Great look at the books we grew up with. I have been reading through all the Newbery Medal and Honor books and have been discovering a lot of books I should have read when I was younger. I went through a Newbery phase when I was younger, but there are lots that I missed. The ones I remember were wonderful. Those cover styles ring so many bells, though the titles themselves are unfamiliar. One I loved – and I can’t remember the title – was filled with the most stereotypical of themes, which is presumably why it both sold and was remembered: the heroine was a terrifically vain rich girl whose family suffered a loss of income and she had to get a job in some sort of catering bakery, and a mark of her great improvement was that after a while she no longer looked at herself in the glass cabinets of the shop (and the boy loved this improvement, obviously). The cover styles are so very much of their time aren’t they? I can’t decide if I love them of if I feel like cringing at how dated they are. I do love that they show faces! The book you describe sounds like just the sort of thing I would have read then. I bet the “Name That Book” group on LibraryThing could help you figure out the title. I enjoyed this book, partly for the nostalgia, but also in my pre-blogging days just for the discussion of books. I hadn’t read a lot of the authors, though their names were familiar. And though I’d read Madeline L’Engle, I had never realized how many different books she wrote! Somehow I missed those. I’d read many, if not most, of the authors but not necessarily the books Skurnick selected. I’m really tempted to look for some of those L’Engle books! After reading Skurnick’s book, I had to reread a few favorites, and Paula Danziger and Ellen Conford hold up surprisingly well! But rereading A Wrinkle in Time was one of the worst reading experiences of my adult life. UGH! I can’t imagine why I loved that book when I was 10. I wondered how Ellen Conford would hold up. I loved, loved, loved her books when I was in middle school, but I’ve wondered if they’d seem dated or immature now. I did reread (or really) reskim Fifteen by Beverly Cleary a couple of years ago and found it both silly and charming. I think I started A Wrinkle in Time when I was a kid, but I either didn’t finish it or forgot everything except the memorable first chapter. I finally read it and some of the sequels as an adult and liked it fine but it didn’t have the magic I thought it might, especially given that I so often love fantasy for younger readers. I do love L’Engle’s nonfiction and the little bit of fiction for adults that I’ve read, so I wonder about her more realistic (I think?) YA. I read (and loved) most if not all of the Sunfire Romance series (the name books). I loved, loved, loved these. I wish Scholastic would reprint them!!! Oh the Sunfires! I could have filled the whole image collection with Sunfires because I too read most of them. (I only read a few of the shorter ones because they seemed too slight, and I may have missed some of the long ones.) The ones I displayed are the ones I remember best, but I could have easily added Amanda (Oregon Trail), Marilee (Jamestown), and Susannah (Civil War). And there was one about the flu and suffragettes that I loved but can’t remember the name. When I think of it, I look for them in used bookstores but no luck. I’d love to see them republished, even if just as e-books. When I was a “tween” and then in my early teens (early 1970s), YA really wasn’t a category. My parents were pretty casual about what I read, so I read everything from Betty Cavana’s high school romances to The Carpetbaggers (I must admit liking the latter more than the former). I remember My Darling, My Hamburger staying with me because it was the first book I’d read where an (illegal) abortion did not result in the death of the woman who underwent it (those were the pre-Roe v. Wade days and, yes, I’m old). Oddly enough, I only read quantities of books aimed at the teen market once I had children of my own and was working in a junior high school library. By the early 80s, YA was a category–I remember the exactly where those shelves were in library and bookstore–but it was much smaller than today. I don’t remember any adults reading these books, not even teachers. They were never on school reading lists. Oh, I need to amend that–I do remember some of the Newberry books being read in school, but those were shelved with the children’s chapter books, rather than with YA. Some of these really are so familiar and dear to me, although I’m sure I Read Summer of my German Soldier too, and what you mention of it is not at all ringing a bell! I still have a copy of Light a Single Candle on my shelf, and I know I read a ton of sweet valley high books way back when… Funny when I first read Go Ask Alice as a teen it blew me away, but I went back to it as an adult and was sorely disappointed and annoyed. It wasn’t even based on a teens diary was it, but concocted by an adult author who wanted to give kids a warning. Judy Blume was a staple here, too. My reaction to Go Ask Alice was the same as a teen. I loved it then, but thinking back, I’m not entirely surprised that it was a fake. I was really into Sweet Valley High for about the first 10 books or so. I was 11 or 12 when the series started, so I remember it being brand-new and having to wait for new books to come out. Oh GOD I hated Summer of My German Soldier. It was one of those books we had to read for school that I’d never have picked up myself, and I hated it soooo much. Also, I am confused: You’ve never read The Secret Garden or A Little Princess? My brain can’t even comprehend that. Those books are imprinted so deeply on my heart, I cannot imagine a world without them. You have to read them! They are so good! And you should get the editions with the Tasha Tudor illustrations. And yes, it’s true, I never read an Frances Hodgson Burnett. It’s a casualty of my getting very little reading guidance as a kid. There was no one pressing classic books upon me, and I never happened upon them on my own. They’ve been on my list for years, along with lots of other children’s fiction I never encountered at the usual age. One of these days! I read and loved all of those books. One you don’t mention is Are You There God, It’s Me, Margaret which I loved because I didn’t get my period until I was 14 and it was good, as you say, to know that I was not alone. Skurnick tells a story of going to South Africa and mentioning that she was reading Are You There God, It’s Me Margaret? to the girls she was speaking to, and almost all of them had read it and loved it. She was amazed that girls so far away and so long after the book’s original publication responded to it so enthusiastically. Oh I am so wallowing in nostalgia here! Did you just read ‘The Homecoming’ or did you follow though and read all seven of the books in the Voight series. I think she was way beyond the usual writer of Young Adult fiction. Some of the themes she explored and the sensitivity with which she did so marked her out as quite exceptional. I read Dicey’s Song and I think one or two of the others, but I never read them all. I liked her writing a lot but fell out of the habit of looking for her books as I got older. You took me on a nostalgia trip with that mention of the YA shelves in B. Dalton and Waldenbooks. I LIVED there from about 1977-1981 (or would have, if they’d let me). I read this book back when it came out in 2009 and thoroughly enjoyed it, even the essays about books I’d never read or don’t really consider YA (sorry, the Little House books are middle-grade at most, IMO). I’ve subscribed to Lizzie Skurnick’s imprint since it started, and have been delighted to get a few old favorites back into my hands that way. Yeah, some of the books didn’t quite fit the YA classification, but I don’t know that she meant to focus on YA or just on books teens and preteens read. From what I remember YA was a new category, or at least a smaller one, back in those days–my library had maybe two bookcases of it when I was a teenager. At about age 13, I was getting books from the children’s, YA, and adult areas. I wonder, though, if some of the books Skurnick covers would have been aged up if they were written today. I’ve been so tempted to subscribe to her imprint. That’s the one! Thank you so much! As an adult, I’ve often wondered about A Wrinkle in Time. I was totally confused by it when I was a kid and couldn’t understand why everyone loved it. Although, I think I might have learned the word ‘mitochondria’ from that book. Unless my memory fails. I wish I could go back in time to find one book. The only part about it I remember is that it mentioned that food hoarding was illegal which makes me think it took place in England sometime around WWII. But that is all I remember. I don’t think I will ever find that one again. For me, A Wrinkle in Time had lots of good scenes, but I didn’t love the book as a whole. I read it when I was young and again as an adult and felt the same both times.